Split Rock Lighthouse is a lighthouse located southwest of Silver Bay, Minnesota, USA on the North Shore of Lake Superior. The structure was designed by lighthouse engineer Ralph Russell Tinkham and was completed in 1910 by the United States Lighthouse Service at a cost of $75,000, including the buildings and the land. It is considered one of the most picturesque lighthouses in the United States. 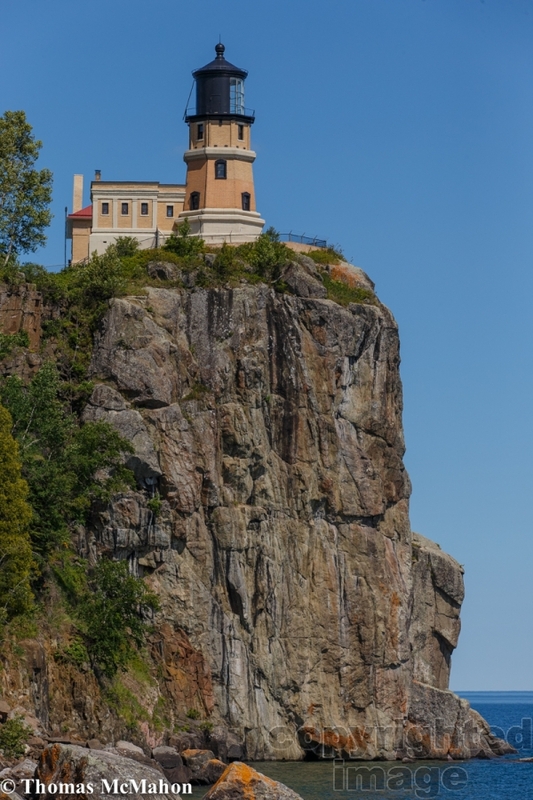 Split Rock Lighthouse was built in response to the great loss of ships during the famous Mataafa Storm of 1905, in which 29 ships were lost on Lake Superior. One of theseshipwrecks, the Madeira, is located just north of the lighthouse. It is built on a 130-foot sheer cliff eroded by wave action from a diabase sill containing inclusions of anorthosite. The octagonal building is a steel-framed brick structurewith concrete trim on a concrete foundation set into the rock of the cliff. 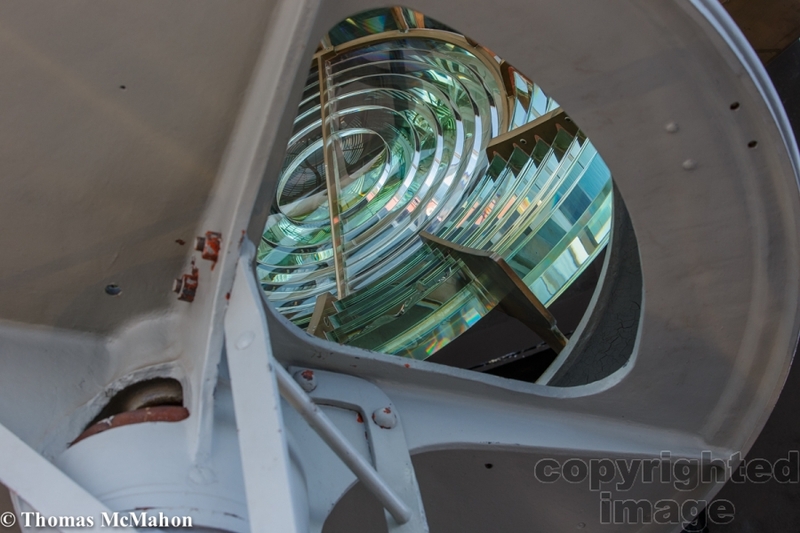 It is topped with a large, steel lantern which features a third order, bi-valve type Fresnel lens manufactured by Barbier, Bernard and Turenne Company in Paris, France. The tower was built for a second order lens, but when construction went over budget, there was only enough funding remaining for the smaller third order lens. The lens floats on a bearing surface of liquid mercury which allows near frictionless operation. The lens is rotated by an elaborate clockwork mechanism that is powered by weights running down the center of the tower which are then reset by cranking them back to the top. When completed, the lighthouse was lit with an incandescent oil vapor lamp that burned kerosene. At the time of its construction, there were no roads to the area and all building materials and supplies arrived by water and lifted to the top of the cliff by crane. The light was first lit on July 31, 1910. Thanks to its dramatic location, the lighthouse soon became a tourist attraction for sailors and excursion boats. So much so, that in 1924 a road (now Minnesota State Highway 61) was built to allow land access. In 1940, the station was electrified and the lamp was replaced with a 1000 watt electric bulb, and the incandescent oil vapor lamp was moved to Au Sable Point Lighthouse in Northern Michigan. 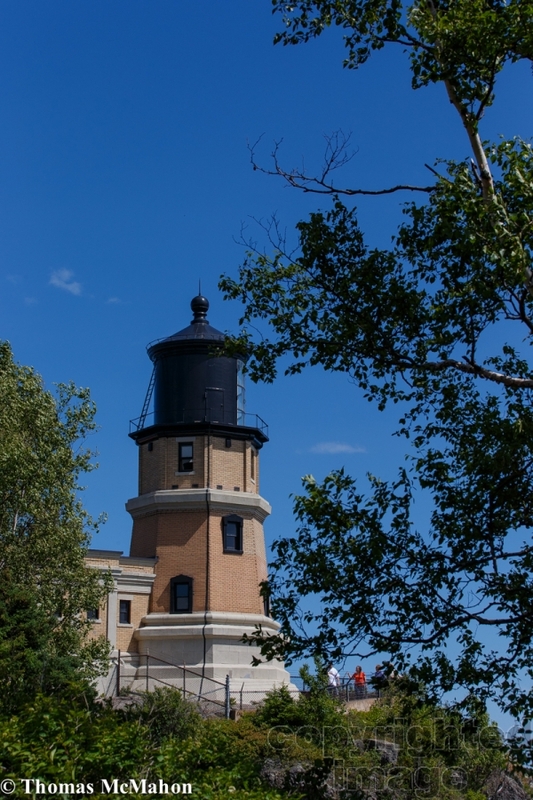 Split Rock was outfitted with a fog signal housed in a building next to the light tower. The original signal was a pair of sirens driven by two Franklin 30 hp (22 kW) gasoline-driven air compressors manufactured by Chicago Pneumatic Tool Company. In 1932 the gasoline engines were replaced with diesel engines. The steam sirens were replaced with a Type F-2-T diaphone (be-you) type signal in 1936. The station and the fog signal were electrified four years later, but was discontinued in 1961. 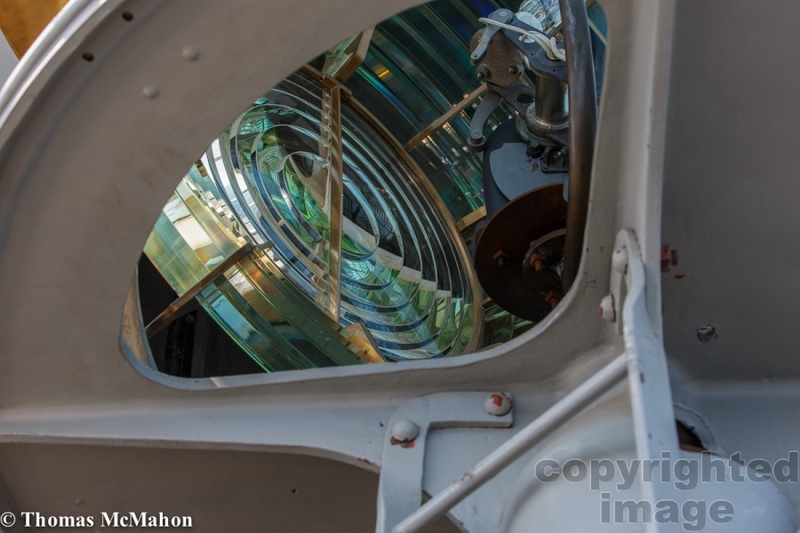 The light was retired in 1969 by the U. S. Coast Guard. The lighthouse is now part of the Split Rock Lighthouse State Park and is operated by the Minnesota Historical Society. The site includes the original tower and lens, the fog signal building, the oil house, and the three keepers’ houses. It is restored to appear as it did in the late 1920s. The site was added to the National Register of Historic Places in 1969. Notwithstanding that the light has been retired, every November 10 the lighthouse emits a light in memory of the SS Edmund Fitzgerald which sank on that date in 1975. On June 30, 2011, the lighthouse was designated as a National Historic Landmark. That list includes four USGA champions in Chen (2010 U.S. Girls’ Junior), Diaz-Yi (2013 U.S. Women’s Amateur Public Links), Kim (2012 U.S. Women’s Amateur Public Links) and Talley (2013 U.S. Women’s Amateur). Alison Lee is the top-ranked female in the World Amateur Ranking. An invitation to the USGA’s practice session does not guarantee selection, and players not at the session are not excluded from consideration. Conspicuously missing from the list, however, is 2012 Curtis Cupper Emily Tubert. She is the only member of that eight-woman squad still eligible to compete in 2014 as the other seven have turned professional. Also, no mid-amateurs were invited to the practice session. The U.S. team will be looking to reclaim the Curtis Cup after losing to Great Britain and Ireland in 2012. 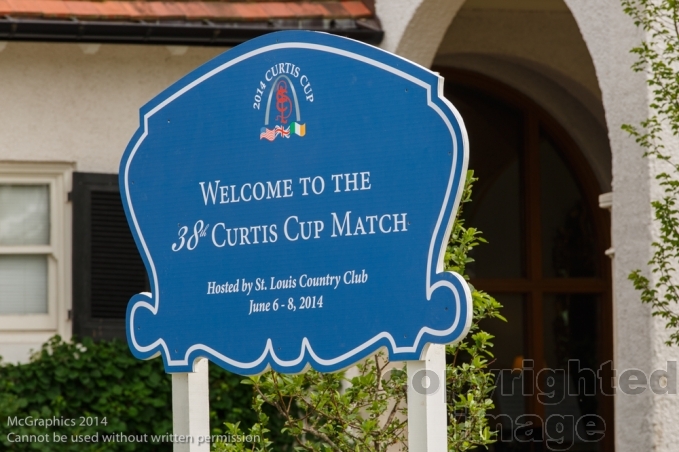 Photos from the 2014 Curtis Cup. 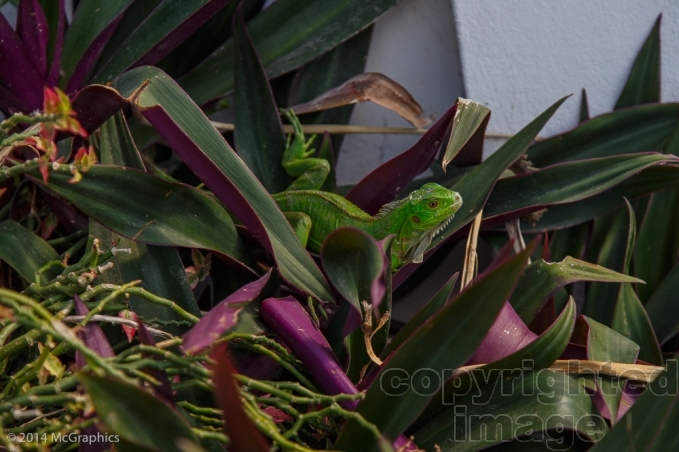 Sint Maarten is a constituent country of the Kingdom of the Netherlands. It encompasses the southern half of the Caribbean island of Saint Martin, while the northern half of the island constitutes the French overseas collectivity of Saint-Martin. Its capital is Philipsburg. The French and Dutch, on the other hand, both coveted the island. While the French wanted to colonize the islands between Trinidad and Bermuda, the Dutch found San Martín a convenient halfway point between their colonies in New Amsterdam (present day New York) and Brazil. With few people inhabiting the island, the Dutch easily founded a settlement there in 1631, erecting Fort Amsterdam as protection from invaders. Jan Claeszen Van Campen became its firstgovernor, and soon thereafter the Dutch East India Company began their salt mining operations. French and British settlements sprang up on the island as well. Taking note of these successful colonies and wanting to maintain their control of the salt trade, the Spanish now found St. Martin much more appealing. The Eighty Years’ War which had been raging between Spain and the Netherlands provided further incentive to attack. Spanish forces captured Saint Martin from the Dutch in 1633, seizing control and driving most or all of the colonists off the island. At Point Blanche, they built Old Spanish Fort to secure the territory. Although the Dutch retaliated in several attempts to win back St. Martin, they failed. Fifteen years after the Spanish conquered the island, the Eighty Years’ War ended. Since they no longer needed a base in the Caribbean and St. Martin barely turned a profit, the Spanish lost their inclination to continue defending it. In 1648, they deserted the island. With St. Martin free again, both the Dutch and the French jumped at the chance to re-establish their settlements. Dutch colonists came from St. Eustatius, while the French came from St. Kitts. After some initial conflict, both sides realized that neither would yield easily. Preferring to avoid an all-out war, they signed the Treaty of Concordia in 1648, which divided the island in two. A legend grew up around the division of the island. According to legend, in order to decide on their territorial boundaries, the two sides held a contest. It began with a Frenchman drinking wine and a Dutchman drinking jenever (Dutch gin). When both had sufficiently imbibed, they embarked from Oysterpond on the island’s east coast. The Frenchman headed off along the coast to the north, while the Dutchman followed the coast south; wherever the two groups met was where they would draw the dividing line from Oysterpond. But as the Dutchman met a woman and stopped to sleep off the effects of the gin, the Frenchman was able to cover more distance, but apparently also cheated as he cut through the northeastern part of the island, and therefore ended up with more land. Though oft-repeated, the story is not historically accurate. During the treaty’s negotiation, the French had a fleet of naval ships off shore, which they used as a threat to bargain more land for themselves. In spite of the treaty, relations between the two sides were not always cordial. Between 1648 and 1816, conflicts changed the border sixteen times. In the end, the French came out ahead with 21 square miles (54 km2) to the 16 square miles (41 km2) of the Dutch side. In 1651, the Compagnie des Îles de l’Amérique sold the French part of the island to the Order of Saint John which was sovereign over Malta. The Order’s rule lasted for fourteen years, and in 1665 it was sold back to the French West India Company along with the Order’s other possessions in the Caribbean. Although the Spanish had been the first to import slaves to the island, their numbers had been few. But with the new cultivation of cotton, tobacco, and sugar, mass numbers of slaves were imported to work on the plantations. The slave population quickly grew larger than that of the land owners. Subjected to cruel treatment, slaves staged rebellions, and their overwhelming numbers made them impossible to ignore. On July 12, 1848, the French abolished slavery on their side of St. Martin. The Dutch followed suit fifteen years later. Cuba was a special experience for me. Santa Fe Photographic Workshops and Arthur Meyerson did a marvelous job arranging for us to meet the Cuban people and to experience how they live. We where encouraged to go out on our own to meet and talk to the Cuban people. I can say all the ones I meet and talked to where really nice people. While some could speak English, others did not, so we had to work our way through the conversation. Luckily, our guides could assist with the language if needed. 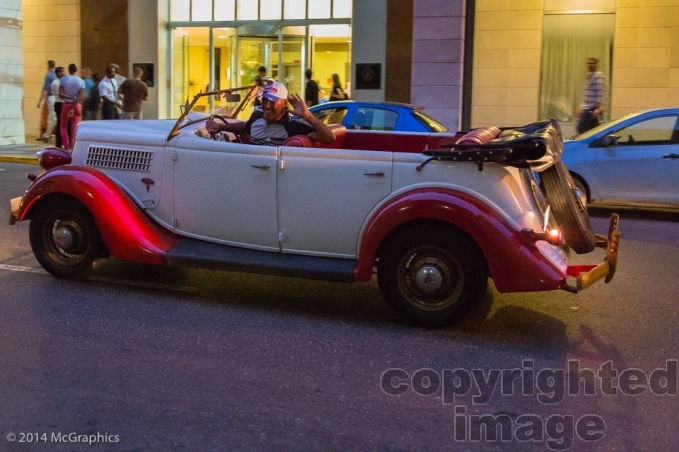 To see the architecture and the cars was like stepping back in time. Our Cuban photographers where Jorge Gavilondo and Carlos Otero. That got us in places that most tourist would not get into. Like two dance companies where they preformed just for our group. During the performance we where able to photograph them. It was breathtaking performance and to be able to photograph them was wonderful, what an experience. A typical day for the group would start at 6:45 am to do “dawn patrol”; photographing until 8:00 am. After breakfast at the hotel we would download what was shot. The group would go out again between 9-10am, coming back to each lunch where ever we wished and to down load our photos again. Between 3-4pm, we went as a group to photograph for a couple of hours. After downloading the photos from the group shoot it was free time. Most of us went out again at sunset to capture the light on the buildings and people. Once we ate dinner it was back to work editing all of the photos from the day’s work. We did so much in such a short amount of time and had an incredible experience. I shot over 5500 photos in 6 days. Here is some information on Cuba. Cuba, officially the Republic of Cuba Spanish: República de Cuba, , is an island country in the Caribbean. The nation of Cuba comprises the main island of Cuba, the Isla de la Juventud, and several archipelagos. Havana is the capital of Cuba and its largest city. The second largest city is Santiago de Cuba. To the north of Cuba lies the United States (145 km or 90 mi away) and the Bahamas are to the northeast, Mexico is to the west (210 km or 130 mi away), the Cayman Islands and Jamaica are to the south, and Haiti and the Dominican Republic are to the southeast. Tourism was initially restricted to enclave resorts where tourists would be segregated from Cuban society, referred to as “enclave tourism” and “tourism apartheid”. Contacts between foreign visitors and ordinary Cubans were de facto illegal between 1992 and 1997. The rapid growth of tourism during the Special Period had widespread social and economic repercussions in Cuba, and led to speculation about the emergence of a two-tier economy. Cuba has tripled its market share of Caribbean tourism in the last decade; as a result of significant investment in tourism infrastructure, this growth rate is predicted to continue. [ 1.9 million tourists visited Cuba in 2003, predominantly from Canada and the European Union, generating revenue of $2.1 billion. Cuba recorded 2,688,000 international tourists in 2011, the third-highest figure in the Caribbean (behind the Dominican Republic and Puerto Rico). Havana is the capital city, province, major port, and leading commercial centre of Cuba. The city proper has a population of 2.1 million inhabitants, and it spans a total of (281.18 sq mi) − making it the largest city by area, the most populous city, and the third largest metropolitan area in the Caribbean region. The city extends mostly westward and southward from the bay, which is entered through a narrow inlet and which divides into three main harbours: Marimelena, Guanabacoa and Atarés. The sluggish Almendares River traverses the city from south to north, entering the Straits of Florida a few miles west of the bay. Old Havana, contains the core of the original city of Havana, with more than 2,000 hectares it exhibits almost all the Western architectural styles seen in the New World. 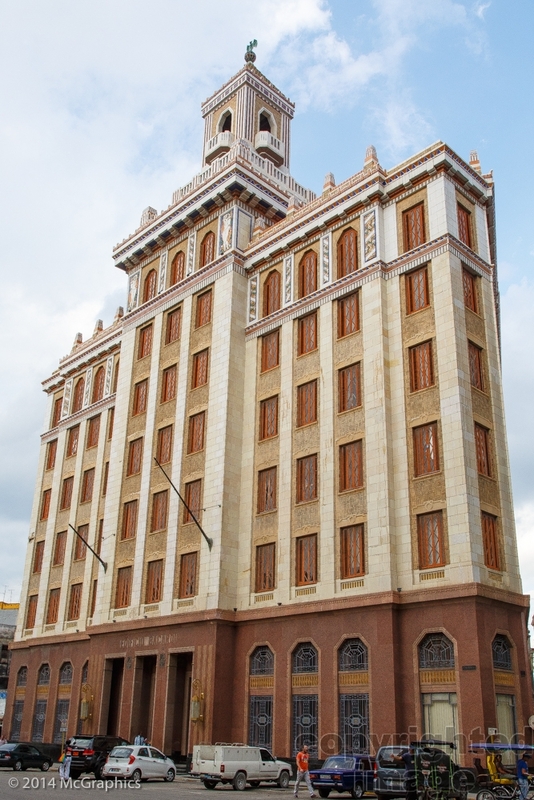 La Habana Vieja was founded by the Spanish in 1519 in the natural harbor of the Bay of Havana. It became a stopping point for the treasure laden Spanish Galleons on the crossing between the New World and the Old World. In the 17th century it was one of the main shipbuilding centers. The city was built in baroque and neoclassic style. Old Havana is the ancient city formed from the port, the official center and the Plaza de Armas. Alejo Carpentier called Old Havana the place “de las columnas” (of the columns). The Cuban government is taking many steps to preserve and to restore Old Havana, through the Office of the city historian, directed by Eusebio Leal. Old Havana and its fortifications were added to the UNESCO World Heritage List in 1982. Cuban music is very rich and is the most commonly known expression of culture. The central form of this music isSon, which has been the basis of many other musical styles like salsa, rumba and mambo and an upbeat derivation of the rumba, the cha-cha-cha. Rumba music originated in early Afro-Cuban culture. The Tres was also invented in Cuba, but other traditional Cuban instruments are of African origin, Taíno origin, or both, such as the maracas,güiro, marimba and various wooden drums including the mayohuacan.  Popular Cuban music of all styles has been enjoyed and praised widely across the world. Cuban classical music, which includes music with strong African and European influences, and features symphonic works as well as music for soloists, has received international acclaim thanks to composers like Ernesto Lecuona. Havana was the heart of therap scene in Cuba when it began in the 1990s. Cuban cuisine is a fusion of Spanish and Caribbean cuisines. Cuban recipes share spices and techniques with Spanish cooking, with some Caribbean influence in spice and flavor. Food rationing, which has been the norm in Cuba for the last four decades, restricts the common availability of these dishes. The traditional Cuban meal is not served incourses; all food items are served at the same time. Viñales Valley is a karstic depression in Cuba. The valley has an area of (51 sq mi) and is located in the Sierra de los Órganos mountains (part of Guaniguanico range), just north of Viñalesm in the Pinar del Río Province. The conspicuous cliffs rising like islands from the bottom of the valley are called mogotes.